Since August is upon us, it's time to take full advantage of the fruits of summer. Nearly every film screening should be held outdoors (we'll make an exception for Ryan Gosling) and all concerts should include a laid-back L.A. sensibility. It's time to unwind with these post-work activities that are sure to give your former snoozy schedule a run for its money! Hey, you guys! Get in touch with your childhood while chowing down on a very adult menu courtesy of Caulfield’s. Order a Truffaut (bottle of rose and a dozen oysters) and laugh along to the classic film while lounging poolside at one of L.A.'s most stunning rooftop pools. When: Tuesday, July 31, 7 p.m.
Where: The Thompson Beverly Hills, 9360 Wilshire Boulevard (at North Crescent Drive); 310-943-1105. Forster (who now goes by Erika Spring) has taken a break from Au Revoir Simone with her self-titled solo EP. For $12, enjoy the crooner's airy vocals along with Alt J's jazzy, yet indie, sounds. Think relaxing vibes on a hump-day evening. What could be better? When: Wednesday, August 1, 8:30 p.m.
Where: The Echo, 1822 West Sunset Boulevard (between Glendale Boulevard and Lemoyne Street); 213-413-8200. Sure, the barista may have your extravagant skim double chai latte (with extra whip) order down pat at your local coffee spot, but why not change it up a bit with a trip to Handsome Coffee Bar? While there's usually just coffee and espresso at this joint, starting this Wednesday the Produce Project will set up a pop-up farmstand with fresh veggies, fruit, and dairy. When: Every Wednesday in August, starting August 1, 5 to 8 p.m.
Where: Handsome Coffee Bar, 582 Mateo Street (at Willow Street); 323-606-3593. 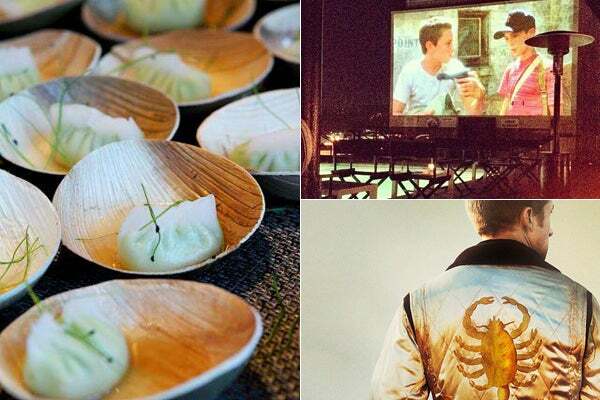 Wish Friday night's plans included dinner and movie with Mr. Gosling? Well, here's the next best thing. Cap off your work week with a screening of the dreamboat's super-suspenseful flick, Drive. We dare you not to take your eyes off of him (or that jacket!). When: Friday, August 3, 11:59 p.m.
Where: The Nuart at Landmark Theatres, 10850 West Pico Boulevard (at Westwood Boulevard); 310-281-8223. Hosted by Sang Yoon (of Lukshon and Father's Office fame), this Asian food-focused event is totally taking over H.D. Buttercup in Culver City. The space will be transformed into a traditional Night Market with vendors setting up shop all over the store. General admission is $55, but for $88 you are granted early entry and access to the chef's lounge. When: Saturday, August 4, 7:30 to 10 p.m.
Where: H.D. Buttercup, 3225 Helms Avenue (at Venice Boulevard); 310-558-8900.